Many careers in math are expected to grow faster than average, according to US government statistics. Yet, American students still perform poorly in math compared to students in other countries. Newer approaches to math are showing much promise and homeschool families are in a good position to take advantage of these. Making math fun and a natural way to approach life's questions are the basis of several new math modes. My absolute favorite site for this is Let's Play Math! This site has so many original, exciting ideas on making math your family's favorite subject that I wish I had more time in my day to implement all of them. I encourage you to spend some time on the site, whether you and your family love or hate math. You will be greatly encouraged and challenged. Your child will learn to be a natural at math as "playing math" is not only fun but it teaches and trains the brain to think mathematically. NaturalMath.com is another math website that understands that all children can be reached with math knowledge and can learn to understand and enjoy math. For example, I have one child who is learning multiplication and for some reason is fearful that it will be too difficult. NaturalMath.com offers many different approaches to understanding multiplication. As I have learned these approaches (I do not remember being taught any of these when I learned multiplication), I share them with her and find appropriate worksheets to help her practice the ones she seems to learn from the most. Number bonds allow children to see relationships between numbers, essential for understanding math at all levels. Math history puts math in a context that makes math more fun for everyone. LetsPlayMath.com features periodic math history tidbits that are very interesting. We also greatly enjoyed the book, The History of Mathematics, by John Hudson Tiner. It was so fascinating that I could hardly put it down. 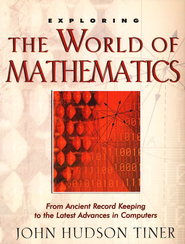 From the early Greeks to the development of computers, this book is very thorough. If you or any of your children find themselves dreading math or not achieving in the subject, please try some of these newer approaches before giving up on math. Math truly can be fun!